For a small community in rural Lee County, Neyami seems to have an angle on interesting. One story is that the name Neyami – it's pronounced like Miami but with an “N” – refers to being about midway between New York City and Miami. Another footnote is that country star Luke Bryan, raised in nearby Leesburg, once played in the band Neyami Road. But these days Neyami is attracting interest for another reason: Landowners and government agencies have teamed up here to preserve rare wetlands and their rarest plant species, Canby’s dropwort. The focal site is Neyami Savanna, a complex of boggy grasslands with open canopies of pine and cypress and one of Georgia’s largest populations of endangered Canby’s dropwort. Oxypolis canbyi is a slender member of the carrot family that dots the savanna with clusters of tiny white flowers in late summer. The loss of cypress savanna wetlands has decimated the species. Recovering Canby’s dropwort to the point it no longer needs federal listing is a priority for the U.S. Fish and Wildlife Service and DNR. Yet Neyami Savanna is also key to other rare wildlife. It provides foraging habitat for federally threatened wood storks and freshwater to five federally listed or at-risk mussel species within 3 miles downstream. 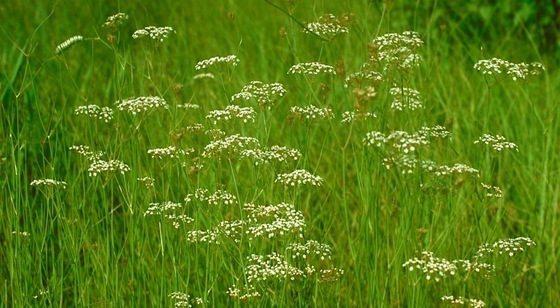 The U.S. Department of Agriculture recently awarded $1.19 million to restore and permanently protect 850 acres of the wetlands and their Canby’s dropwort populations. The funding from the Natural Resource Conservation Service’s Wetland Reserve Enhancement Partnership will be used for conservation easements and ecological and hydrological restoration. Partners include local landowners, DNR, the Georgia Department of Transportation, the Fish and Wildlife Service and the Georgia Plant Conservation Alliance. Managing these wetlands as a whole is vital to long-term ecological restoration, according to DNR Nongame Conservation Section botanist Lisa Kruse. “Our neighbors are critical to the success of any management here,” Kruse said. Read more about the Neyami Savanna project. Georgians feed birds more in winter than during any other season, and with a wider lineup of foods. Ranging from seeds to suet and even doughnuts, this smorgasbord attracts a variety of birds. But none may be more welcomed than the downy woodpecker. 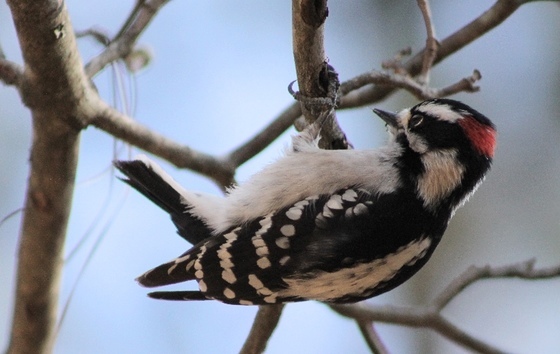 Read the rest of Terry’s column for insights into downy woodpeckers, including favored foods and tips for telling them apart from hairy woodpeckers. 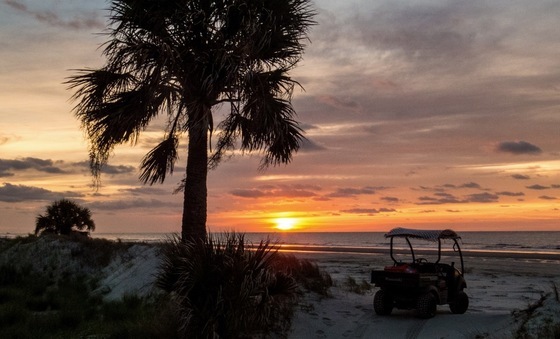 The acquisition of the last part of Sansavilla Wildlife Management Area was announced in mid-October. 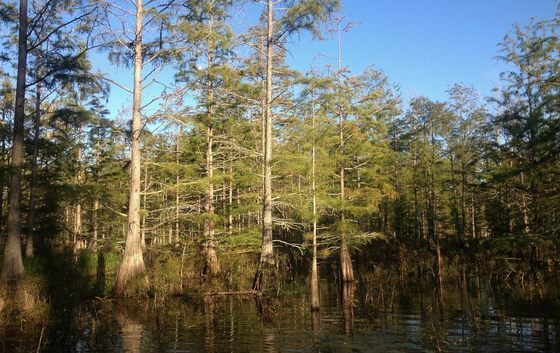 A week later, a Nongame Conservation Section employee discovered another example of why this 19,500-acre slice of the Altamaha River watershed is such a treasure. Ethan Hughes was doing field surveys for habitat mapping on the Wayne County WMA when he discovered jug orchid in a forested seep. 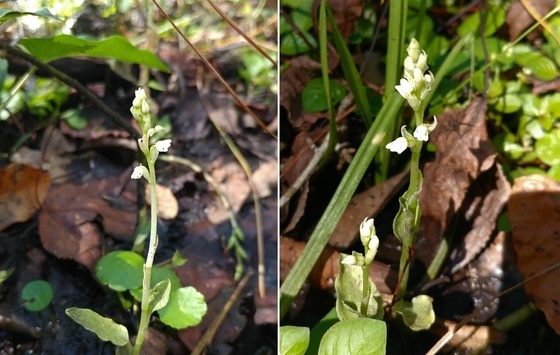 That’s the first time the orchid has been recorded in Georgia. Jug orchid, Platythelys querceticola, grows no taller than 6 inches (it’s also called low ground orchid) and is an inconspicuous inhabitant of swamps and floodplains. More common in Central and South America, the plant’s range extends into Florida, Mississippi and Louisiana. The species rates as rare in the latter two states. Hughes’ find adds to Sansavilla’s growing lineup of plants, animals and habitats considered conservation priorities. Remote sensing and field work done to develop fine-scale habitat maps on public lands along the lower Altamaha also recently turned up high-quality calcareous wet oak flats and small-stream floodplain forests, two other unique habitats, wrote Nongame Conservation biologist Jacob Thompson. Those details will factor into management plans for the WMA and the corridor. 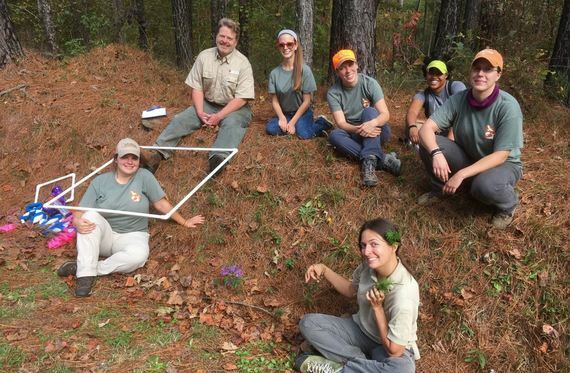 Long-term monitoring of Georgia aster populations is required by a 2014 Candidate Conservation Agreement aimed at keeping the rare wildflower off the endangered species list. DNR’s Dr. Mincy Moffett Jr., Tom Patrick and Sabrina Sewell have coordinated monitoring, including giving demonstrations to partners and establishing and collecting data at sites ranging from Oaky Woods Wildlife Management Area near Perry to Red Top Mountain State Park north of Marietta. What to get the amphibian-lover in your life? Stuff their stocking with "Calls of the wild: vocalizations of Georgia's frogs," a DNR CD featuring the calls and life histories of frog and toad species found in Georgia. How to order. “The journey of a semipalmated sandpiper” is a new story map that follows the Arctic-to-Brazil-and-back migration of a tagged sandpiper. The multimedia presentation by the Western Hemisphere Shorebird Reserve Network and Manomet includes former DNR nongame Program Manager Brad Winn, now at Manomet. Bullard Creek Wildlife Management Area has grown by 491 acres, thanks to the addition of Georgia DOT’s Bell Telephone Tract. The 14,000-acre WMA near Hazelhurst is popular among hunters, horseback riders and wildlife viewers. 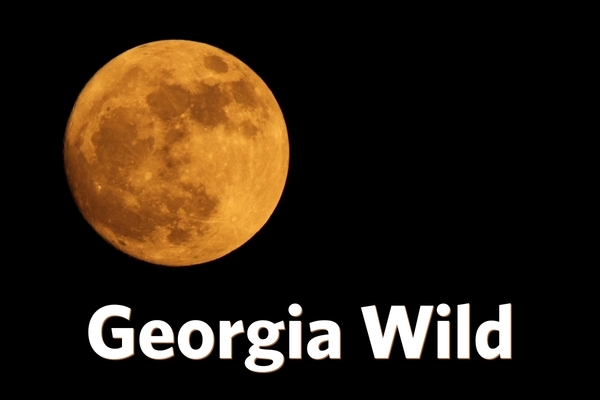 Wanted: Projects that need a hand helping Georgians enjoy and better understand animals, plants and habitats emphasized in the State Wildlife Action Plan. 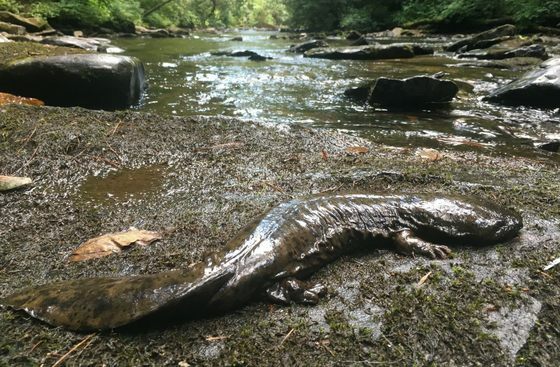 With support from the Georgia Natural Resources Foundation, DNR Nongame Conservation has revived the competitive small-grants program to develop wildlife viewing opportunities statewide that raise awareness of key species and habitats. Georgia’s Give Wildlife a Chance Poster Contest is turning to the dark side. The theme of the 28th annual competition for grades K-5 is “Nature at night,” turning attention to the adaptive behaviors of wildlife and interactions with plants. Talk about eagle power: The male eagle at the livestreamed Berry College nest was spotted last month carrying a large dead limb – presumably for nest renovations. 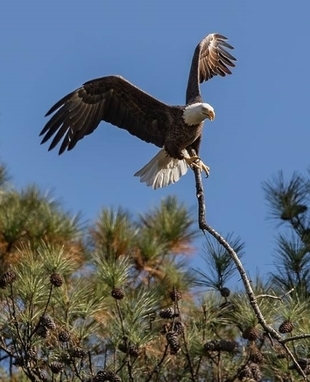 Although the bird almost immediately dropped the limb after breaking it off (but not before photographer Gena Flanigen took this shot), the limb measured 18 feet long and weighed 26 pounds. Watch the eagles via Berry College and www.georgiawildlife.com. Teens keen on birding will want to check out Camp TALON (Teen Adventures Learning Ornithology and Nature). With discounts for early signees, registration is open for the coast-based summer camp for teens with a strong interest in the outdoors, birding and ecology. Names in the news: St. Marys Middle School sixth-grader Lena Whitesell won the 2017 CoastFest Endangered Species Art Contest with her drawing of manatees that topped more than 1,000 entries from 22 schools. The Southeastern Association of Fish and Wildlife Agencies has presented former Fish and Wildlife Service Southeast Regional Director Cindy Dohner with the C.W. Watson Award, the organization’s highest honor. Florida Fish and Wildlife Conservation Commission Executive Director Nick Wiley, a Georgia native, will join Ducks Unlimited as its chief conservation officer in January. Savannah native Dr. Simona Perry has been named Ogeechee riverkeeper and executive director. Jan. 27 – Red Hills Fire Festival, Tall Timbers, Tallahassee, Fla.
in the last Georgia Wild. (audio) "Why bird poop is white," BirdNote. Also: "Why birds' feet don't freeze"
Canoochee Bogs got an updo last month. 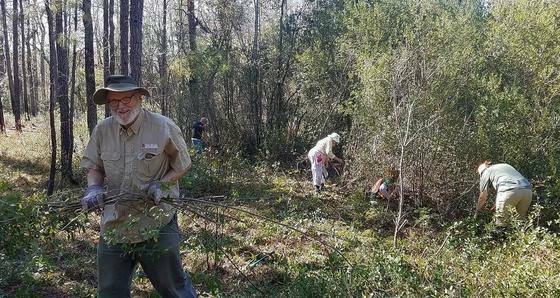 A Georgia Plant Conservation Alliance workday sporting 26 people from eight organizations cut truckloads of shrubs to open key areas to prescribed fire and help restore the privately owned pitcherplant bogs in southeast Georgia. The work came with surprises: locations of state-protected flame flower and yellow pitcherplant, species botanists didn’t know were there. Volunteers also cleared around orange-fringed orchid. The changes will allow prescribed fire to burn into the bogs and increase habitat for rare plants. Coastal Plain herbaceous bogs are small but rare jewels, a priority habitat for rare-plant conservation. They face threats such as hydrologic disturbance, development and fire suppression. GPCA partners help restore, monitor and maintain the bogs, and safeguard many southeastern Coastal Plain pitcherplant and orchid species.